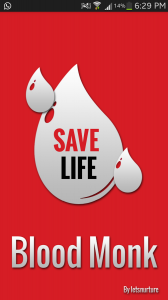 We have launched an android app BloodMonk for Blood Donors of Ahmedabad.. If you are looking for blood donors in Ahmedabad.. you can use this application, you will get a list of blood donors of Ahmedabad. All Blood Donors are verified and looking to help society. Our aim is to build a large and verified database of blood donors. We are looking forward to launch same application on iOS & Windows Very Soon.